Please visit the About section for more Festival FAQs. How can I buy tickets in the member presale? When/how will I get my personal offer code for the member presale? Will mobile ticket sales be enabled? How fast do tickets sell-out? When will the member tickets be delivered? Why is there a delivery delay for tickets? How do attendees with disabilities enter the festival? Do PAIRED® + GABF ticket holders have a unique entrance? Can a non-member attend the Saturday Afternoon Session? I just joined online, when will I be able to purchase my tickets? What are you doing to prevent ticket scalping? How do volunteer ticket vouchers work? See 2018 Ticket Prices for detailed information. Are you a member of the American Homebrewers Association (AHA) or the Brewers Association (BA)? If so (and you’ve purchased your membership by July 18, 11:59 p.m. MT), you’re eligible! We’ll notify you via email in advance of the ticket sale with instructions for how to purchase. The Saturday afternoon session of the Great American Beer Festival (GABF) is open exclusively to AHA and BA members. You must purchase a membership in the AHA or BA by July 18, 11:59 p.m. MT, to be eligible for the member presale. NOTE: There are more members of the AHA and the BA than there are attendee slots for the Saturday afternoon Members-Only session. In other words, not every association member will be able to purchase tickets to the Members-Only session, but all members (as of the cut-off date and time listed here) are invited to participate in the members presale. AHA and BA members who joined prior to the July 18, 2018 cutoff date will receive an email containing their personal pass code (a randomized, case-sensitive code). Members can expect this email on July 24 and again on July 31, 2018. If you did not receive your code, please check your spam folder. If you have previously unsubscribed from GABF emails, you must resubscribe to email from GABF or your code will not be delivered. Yes, Designated Driver tickets are $30 for the general sessions and only available for purchase during the ticket sale. Free, non-alcoholic sodas will be available and each Designated Driver receives a complimentary gift, available in the Designated Driver Lounge. Designated Drivers are welcome to attend the beer and food seminars, walk around the festival floor, or relax in the Designated Driver Lounge. Designated Driver tickets are not available for PAIRED. You may purchase a ticket to PAIRED and choose not to drink; there will be non alcoholic beverages available. For the 2018 GABF, tickets will be available to members beginning Tuesday, July 31, 2018 at 10:00 a.m. MT online via AXS.com. The public ticket sale starts on Wednesday, August 1, 2018 at 10:00 a.m. MT via AXS.com. Yes! You’re welcome to purchase tickets for the member-only presale and public sale via the AXS app. Ticket prices for each of the sessions include a festival program, a commemorative tasting cup, unlimited one-ounce samples of more than 4,000 beers, access to educational and experiential talks, and a festival guide to help you navigate the floor. The Saturday Afternoon Members Only Session includes all of the previously mentioned benefits, as well as a more intimate atmosphere as the attendance is limited to members only, and the first opportunity to sample the much-anticipated gold, silver and bronze medal winners of the 2018 GABF competition. GABF tickets are not refundable. If you are unable to attend the festival you can try selling your ticket for face value via AXS Flash Seats, in the classifieds section of the AHA Forum or through the Great American Beer Festival Facebook page. Tickets purchased through AXS may be transferred to another party (once they are released) via Flash Seats. Holder voluntarily assumes all risk and danger incidental to the event for which this ticket is issued, whether occurring prior to, during or after the event. Holder voluntarily agrees the Brewers Association sponsors of the event, and the venue are expressly released by holder from any claims for injuries or death arising from holder’s participation in and the travel to and from this event. The ticket may not be resold or offered for resale in a manner or at a price in violation of any federal, state or local laws or regulations. Holder grants permission to Brewers Association and sponsors of the event to utilize any photographs, motion pictures, videotapes, recordings and any other references or records of the Great American Beer Festival(R) that may depict, record or refer to holder for any purpose, including commercial, by the Great American Beer Festival, its sponsors, the venue and their licensees. Holder acknowledges that the event may be broadcast or otherwise publicized, and hereby grants permission to utilize holder’s image or likeness in connection with any live or recorded transmission or reproduction of such event in printed photographs or online transmissions. By using this ticket, Holder (i) consents to allowing event security staff to inspect his or her person and any bags, clothing, or other articles for security purposes, whether by walk-through metal detection, handheld metal detection, bag checks or otherwise and (ii) acknowledges and agrees that Holder may be denied entry to or ejected from the event if Holder is in possession of any item or object that is considered potentially dangerous, hazardous, inappropriate and/or potentially injurious to other patrons, and any prohibited items may be confiscated. This ticket cannot be replaced if lost, stolen or destroyed and is valid only for the date and event for which it is issued. This ticket is not redeemable for cash. It is unlawful to reproduce this ticket in any form. Unlawful resale is grounds for seizure and cancellation without compensation. There is no re-entry into the facility. Holder agrees admission to the event is restricted to individuals age 21 years or older. Proof of age is required for admission. No outside beverages allowed. Purchase tickets only from authorized outlets. How fast do tickets sell out? For the past few years, GABF tickets have sold out before the festival, and increasingly quickly. In 2017, tickets sold out in 4 hours, 15 minutes. Please plan accordingly. For the General Sessions there is a limit of six tickets per session per ticket buyer. Individuals with greater than six tickets per session per ticket buyer will have their overage canceled and refunded. For the Members Only Session, the ticket limit 2 tickets per member number. American Homebrewers Association and Brewers Association members will receive a pass code via email to purchase tickets for this session. Tickets can be delivered via AXS Flash Seats or for a fee paper tickets can be mailed. Tickets held at Will Call must be picked up by the person whose name is on the order. Ticket holder must present a photo ID. Will Call opens the day of the first session and is located in the lower lobby of the Colorado Convention Center. All tickets will be released on or before August 10, 2018. Any delay is for fraud checking and to reduce scalping. A ticket delivery delay has been instituted as an additional anti-scalping measure. Attendees with disabilities should enter the Convention Center via an automatic door near the Big Blue Bear at 14th St. and California. Follow the ramp down to Lower Lobby A, where across from Will Call there is an elevator entrance. There, our disabled guests will have their ID checked and ticket scanned, receive a wrist band, and continue up the elevator to the festival entrance. PAIRED + GABF ticket holders can enter at 14th Street by the Blue Bear and proceed forward, down the ramp towards the Bellco Theatre. Once inside, proceed to PAIRED where your PAIRED + GABF ticket will be scanned (again) for entrance into the pavilion—keep your app open! Can a non member attend the Saturday Afternoon Session? Yes, tickets are transferable. A non member can attend the Saturday Afternoon Session if the tickets were purchased by a member. Unfortunately, the secondary market for popular tickets persists, despite many efforts to thwart it. From hot sporting events and headliner concerts to your favorite beer festival—sell-out events are subject to ticket brokers finding ways to buy and re-sell tickets. Some ticket brokers even make speculative sales before they have tickets in hand—sometimes well before tickets go on sale! There are measures in place to decrease access for scalpers, including the ticket limits that we set for GABF ticket purchases and AXS’ anti-bot and other security measures in their selling system. 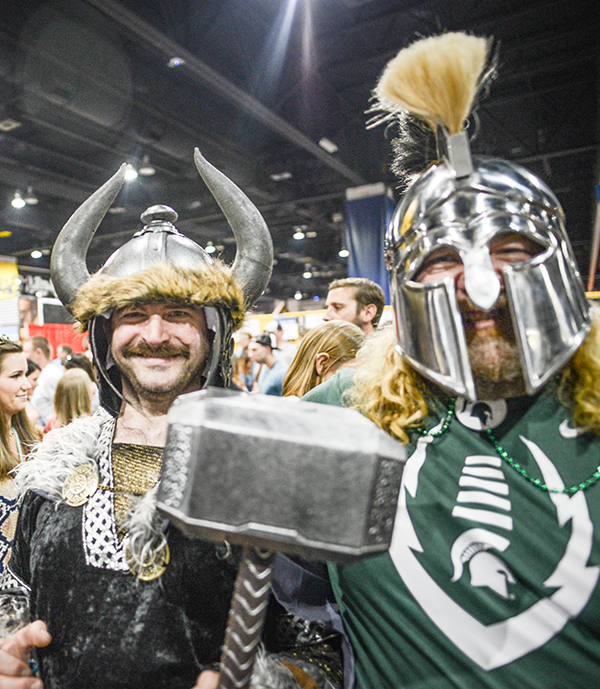 (AXS reviews all purchases to enforce our GABF ticket limits.) Again, though, while this decreases access, it unfortunately does not prevent a secondary market. To ensure you have a valid ticket, purchase tickets from authorized outlets only. I just joined the AHA or BA online. When will I be able to purchase my tickets? You must purchase a membership in the American Homebrewers Association or Brewers Association by July 18, 11:59 p.m. MT, to be eligible for the member presale. Anyone who joins after 11:59 PM MT on July 18, 2018 is not eligible to purchase as a member. The member presale begins at 10:00 am MT on Tuesday, July 31, 2018. Questions about volunteer ticket vouchers may be directed to volunteer@brewersassociation.org. Ticket information is subject to change.